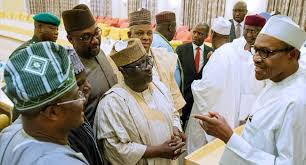 President Muhammmadu Buhari and three state governors of the All Progressives Congress (APC) are currently locked in a crucial meeting which is holding inside the President’s office at the Presidential Villa, Abuja. The meeting is holding barely 24hours after aggrieved members of the APC formed a new faction, the Reformed All Progressives Congress (R-APC). The state governors in attendance are; Abdulaziz Yari of Zamfara State, Abubakar Badaru of Jigawa State and Abubakar Bagudu of Kebbi State. Sources say the action of the Reformed APC members, who are backed by majority of Senators and Reps members, is causing serious ripples. Buy brand new affordable Laptops, Phones, Electronics on Jumia and get them anywhere you are in Nigeria.